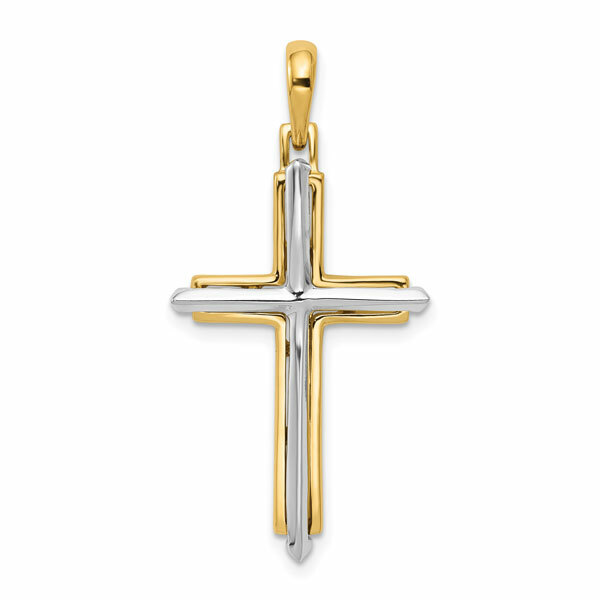 A beautiful cross necklace pendant crafted in 14k two-tone gold, from Apples of Gold Jewelry. The pendant design is a cross within a cross style of yellow and white gold and the cross measures 1 1/16" tall (or 1 3/8" tall w/ hoop and bale) x 11/16" wide. This cross is suitable as both a men's or women's cross pendant. The cross necklace weighs approx. 2.24 grams of 14k gold and is made in the U.S.A.! Add a matching 0.9mm box chain in either 18" or 20" to match or order from one of our gold chains separately to find a chain suitable to your taste and size. We guarantee our 14K Two-Tone Gold Polished Cross within a Cross Necklace Pendant to be high quality, authentic jewelry, as described above.